At the preliminary Eglinton West/Allen Road station design Open House on February 2nd, 2012 and in the online consultation, local residents highlighted their preference for a south-side station entrance to access the future Eglinton-Crosstown. Please review the complete consultation report. A final decision on a south side entrance will be made over the coming months based on several factors including cost/overall project budget, community input and engineering factors. The following are potential options for the south entrance, please review and then scroll to the bottom and have your say as to which you prefer. 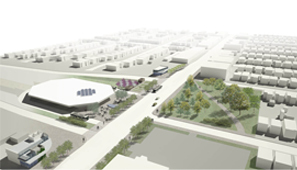 Option 0 would result in no south entrance to the Allen Road - Eglinton West Station, which is the original design. The original design advised that the main station entrance for the Allen Road – Eglinton West Station will remain unchanged. An east station entrance will be located at Allen Road North and Eglinton West, and a west station entrance will be located at Allen Road South and Eglinton West. Option 1 consists of a pavilion type entrance located at the north west corner of Ben Nobleman Park. It has continuous glazing on three sides permitting visibility from the street to the park, and from the park to the street. It serves as an entrance to the park, through the front entrance, and permits an easy connection to the existing east to west cross path in the park. Option 2 consists of a green roof structure designed so as to appear to grow out of the park’s topography. It follows the pavilion concept in providing an entrance to the park and visibility to and from the park. Option 2a consists of the green roof structure, reoriented to open to the west at Everden Road, rather than to the east. It still provides the amenities of a south side entrance; the cost benefits of a more economical entrance; all the while integrating into the park to be much less noticeable from within the park. Option 2b consists of a simple rectangular-volume entrance located at the north west corner of Ben Nobleman Park. The concept is to have a structure that is very open; almost transparent. It has continuous glazing on four sides permitting visibility from the street to the park, and from the park to the street. Entry is directly from the Everden Road sidewalk located on the west side of the building. Option 3 consists of a south side entrance – similar in design and material to the east and west entrances – within the Division 13 Police Station parking lot. The entrance is located further south than the park side options due to the presence of utilities running on the south of Eglinton Avenue that must be avoided. Option 4 consists of a Glass Box design for the south entrance. The minimal sized entrance can be easily removed in the future so as to offer greater flexibility in design for future developments on the site – while still maintaining an entrance.